My name is Rachael, some of you may know me as Dr. Knit, I am the newest full time member of the staff here at 3 kittens. I am taking over for Ms. Tiffany who, as you probably know is moving far far away. We will all miss her! That being said I am really excited about being here and taking over her classes! I sat in on a few classes with her last month in preparation for her departure. She taught the 2 socks on 2 circulars technique, which I adore! 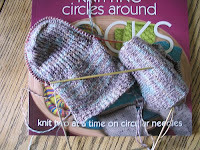 I am so excited to have a complete pair when I am done, no more second sock symdrome for me! I also sat in on the Scarf Style class in May. I finished the capelet in time to wear to a wedding this weekend. I got lots of compliments all night long! Its on display in the shop now. I am very excited about the scarf we chose for the next class (June 11th, 6-8pm). It is the Midwest Moonlight scarf by Ivy Begelow. Some simple lace with some garter stitch in between give this scarf a gentle wave. Look for the sample swatch in the shop soon. < Previous >3 Marys at 3 Kittens -& Memorial Day, too!